$810.79+ When life gives you lemons, make blue lemonade. Plenty of grunt for transcoding and the extra cores to prevent stuttering if the machine is downloading, recording etc while you are trying to watch a movie and/or sream music. No overclock but can turbo boost to 3.9GHz if loaded. CPU also provides the graphics processing via the built-in GPU and at 1080p is entirely adequate. Solid processor, all the power needed for gaming. from completed build I shall call him... Bob! Multitasks like a beast, it is a great CPU for the money! Since this not going to be for gaming or anything intensive I wanted something decent but nothing that ran too hot. It's a locked i5-4690k, what else is there to say. Functions perfectly, and the stock heatsink is just fine. 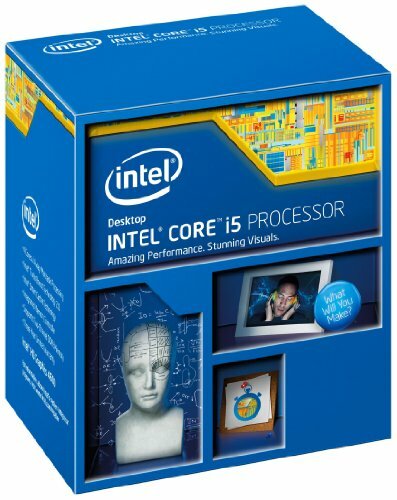 You can't ask for anything better for this price, very balanced CPU runs everything just fine! This CPU is all I need for gaming. Furthermore it has some extra threads for multitasking and it does perfect so far. You can download, play the game and watch video at the same time without any stuttering. It is not expensive and not cheap. It has good Value for Money mark . A solid worker, handles everything I throw at it and can handle gaming + OBS recording reasonably well, although you'd be better off with a hyperthreaded i7.